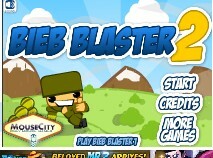 Bieb Blaster 2 is another point and click physics game from Mouse City in which you only have one goal: to blast the Bieb. This game has 30 levels and in each of them that character that looks like a female pop singer is there to annoy you, so you must shoot it with a cannon. Aim with your mouse and fire if you think you got the right angle projectile power which is shown in an arrow bar. Meanwhile, I embedded a Bieb Blaster 2 walkthrough showing all levels solution so you don't have to. You're welcome.